The Chicco Lullago Portable Bassinet is a great option for families that travel frequently, whether it be across the world or just over to ma and pa’s house frequently. 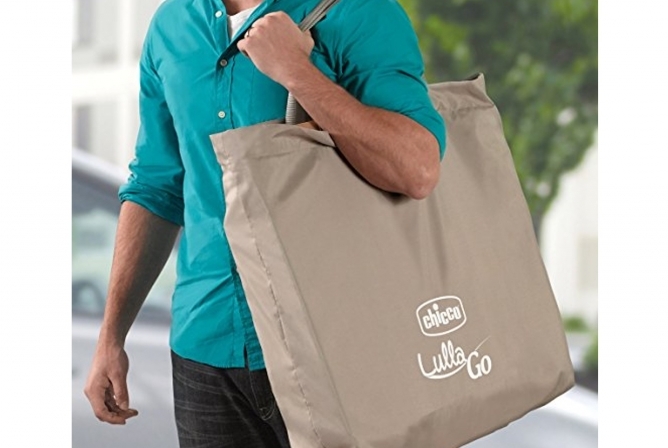 The Lullago assembles or disassembles in less than a minute and is extremely easy to travel with. It could also be a great option for families with limit space that would like to stow away the bassinet when it’s not in use. Also included is a great little tote bag that all of the Lullago parts fit easily into for lugging around from place to place. All-in-all, the Lullago is a great option for many families who are looking for an easy to use, transportable bassinet on a tighter budget. For families that are constantly on the go, the Chicco Lullago Portable Bassinet is a portable and affordable option. Chicco is one of the most popular baby brands in Europe, and for good reason. They make solid baby gear that meets the needs of families around the world. When they made the Chicco Lullago Portable Bassinet, they had easy use and practicality in mind for the on-the-go parent. …has a sturdy build with metal legs and sleek materials. However, safety for the Chicco Lullago Portable Bassinetis also a priority. The Lullago is JPMA certified (a great independent certification that proves this is a safe product) and has a sturdy build with metal legs and sleek materials. It comes with anti-slip feet that prevent it from moving around the floor when in use. Yet, the fabric that makes the lining is polyester. Also, there are no claims made that materials don’t contain fire retardants, so it’s safe to assume that they do. That being said, materials and structure meet the required safety standards but do not go above and beyond to include strictest safety criteria like the BabyBjorn Cradle. There are also only two mesh windows unlike many other bassinets on the market that have 360-degree mesh walls. Although the rest of the material can be considered breathable, mesh is the best option if baby’s face were to be pressed against the side of the bassinet. Still, the soft and all-enclosed walls are a plus in case baby were to bump against them, assuring that baby’s little limbs won’t get stuck in any openings or crevices. What’s unique about the Chicco Lullago Portable Bassinet is that the sleeping area is a little bigger than the standard bassinet. This means that baby can use it for a longer time period and have more room to be a wild sleeper. …the sleeping area is a little bigger than the standard bassinet. Included in this package is a large mattress pad that also comes with a zippered sheet. There are two mesh windows that are meant to be placed on either side of the baby’s head for increased air flow. The rest of the walls are made of polyester material and are still breathable. However, this could make ventilation lower than if all the walls were mesh. 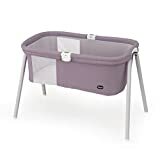 The included mattress sheet for the Chicco Lullago Portable Bassinet is very soft but according to the manual it needs to be hand washed, a big downside for anyone who has a baby that pukes, poops, or pees…which is pretty much every baby. However, many parents have commented that the mattress is very comfortable for their baby, yet still provides the right amount of firmness to be safe. With a bigger sleeping area than most other bassinets out there, the Chicco Lullago Portable Bassinet has the ability to be used until 6 months of age, hoping to decrease the risk of SIDS. 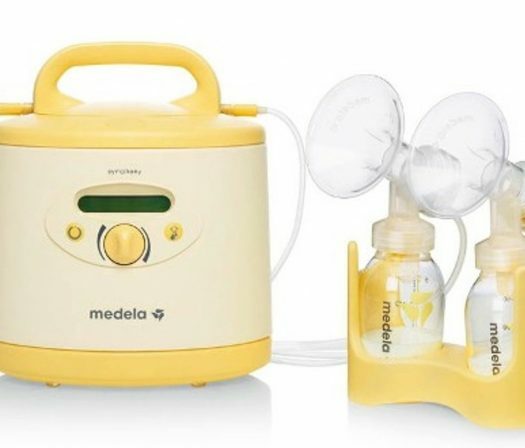 This is very doable with the Lullago, and many parents have even gotten longer use out of it than 6 months. 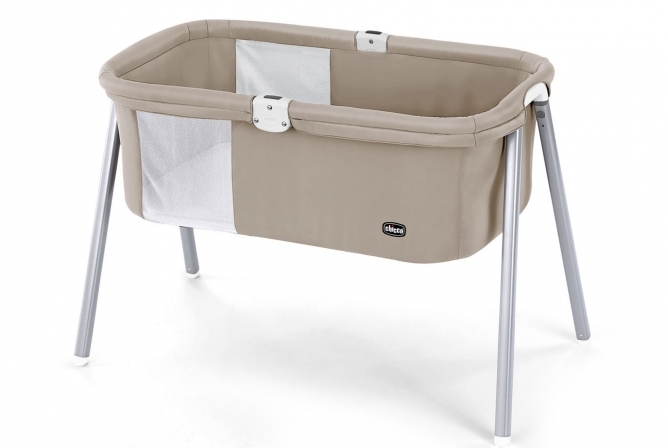 The dimensions for the whole Chicco Lullago Portable Bassinet are 36” x 27” x 22”. Dimensions of the mattress, which gives us a clearer picture of how much room your baby has to grow, are 32 inches long by 19 inches wide. There are replacement sheets that are available for purchase the Lullago, but many parents opted to buy their own fitted (and easy to wash, but more on that below) sheets. Because it’s a larger mattress size, conventional bassinet sheets won’t fit, so sheets might be harder to find. Some parents found that the American Baby Company’s Fitted Mini Crib Sheet worked great for this bassinet mattress. It was a little bigger, but the edges were fitted and tucked just fine. The Lullago also weighs in at around 17 pounds, so it’s not the lightest bassinet out there, but still a good weight to carry it around comfortably within the home. One point that a few parents made was that the bed for the Chicco Lullago Portable Bassinet was low to the ground. Although it fits perfectly next to a parent bed, it takes a big reach towards the floor to pick your baby up. This could make it difficult for C-section moms or anyone that might have difficulty reaching a great length to pick a baby up. This also means you’ll have to get out of bed each time baby needs tending to and might make it difficult to comfort baby back to sleep while everyone stays in their beds (like patting or rubbing their back while they stay in their bed and you stay in yours). Probably the top feature of the Chicco Lullago Portable Bassinet is its ability to be taken down and transported anywhere. No other bassinets we’ve reviewed had this ability, so this makes the Lullago optimal for traveling parents or for use at home, on vacations, or visiting friends or family. It sets up in seconds thanks to the convenient Snap-On legs and one-piece top structure. A claim by Chicco is the ability to assemble or disassemble the Lullago in under a minute. 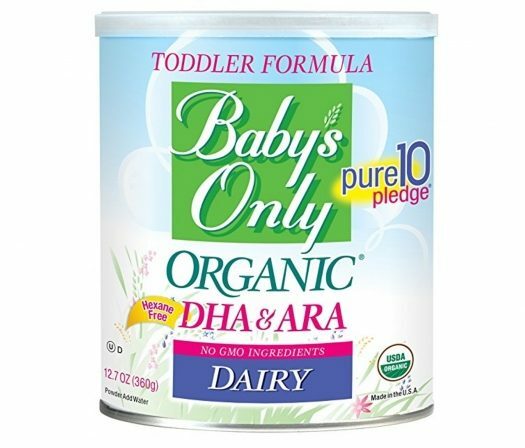 Many parents can back up this claim and state that it is extremely easy to put together or take down, and stows away nicely in the included tote bag. The only downside is that the tote bag has an open top, making it easier for parts to fall out while traveling. It sets up in seconds thanks to the convenient Snap-On legs and one-piece top structure. One great feature (that many parents look for in baby gear) is that the Chicco Lullago Portable Bassinet is washable. All fabric parts can be removed for washing, but it does state that all fabrics need to be hand washed and hang dry only, which is a huge downside for many parents. The included mattress sheet is also hand wash only causing many parents to look elsewhere for an easily washable sheet. Some parents opt to use the Chicco Lullago Portable Bassinet for traveling (for the first 6 months at least) instead of a pack and play due to the small size and extremely easy setup. It’s sleek and simple design make it a cute baby accessory for inside or outside the home. Also, due to the larger sleeping area, many parents don’t have a problem with their baby outgrowing this bassinet before 6 months. 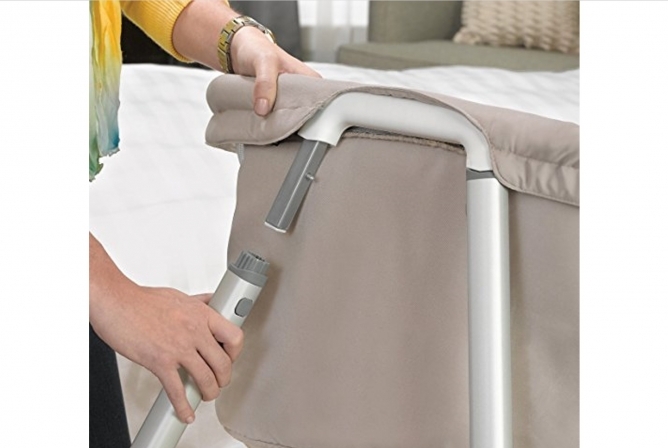 Long term use is a great feature for the Chicco Lullago Portable Bassinet. Unlike most bassinets, the sleeping area for the Lullago is roomier, giving your baby more space to grow and sleep. The recommended weight limit is to use up to 20 pounds, and many parents say their babies reach the weight limit before actually running out of space (not the case for every other bassinet we’ve reviewed). Therefore, it’s safe to say that most babies can use this bassinet for at least five months (unless you have a future NFL or NBA player on your hands). The sleeping area for the Lullago is roomier, giving your baby more space to grow and sleep. The price for the Chicco Lullago Portable Bassinet is extremely affordable compared to many other bassinets today. Due to its simple design and materials, the Lullago is reasonably priced and well-made. Although it’s not the Cadillac of bassinets, you get a great size bassinet that is perfect for traveling, a mattress, mattress sheet, and a tote bag for easy transport. This is a great value, as many high-end bassinets don’t even come with a mattress sheet these days! The Chicco Lullago Portable Bassinet is a great option for families that travel frequently, whether it be across the world or just over to ma and pa’s house frequently. It could also be a great option for families with limit space that would like to stow away the bassinet when it’s not in use. Although it doesn’t have some high-end details like other bassinets, the Chicco Lullago Portable Bassinet assembles or disassembles in less than a minute and is extremely easy to transport. Buying your own mattress sheets is almost a must for easier cleaning, but otherwise, this is a great option for many families who are looking for an easy to use bassinet on a tighter budget.